A client wanted to update their apartment, quickly and cheaply. They have a lovely modern apartment, in Brooklyn, with floor to ceiling windows. We ended up using some of their old pieces and mixing in some new buys. I wish I had a photo of the foyer before. It was all white with nothing hanging on the walls and no where to place keys and mail, when they entered. 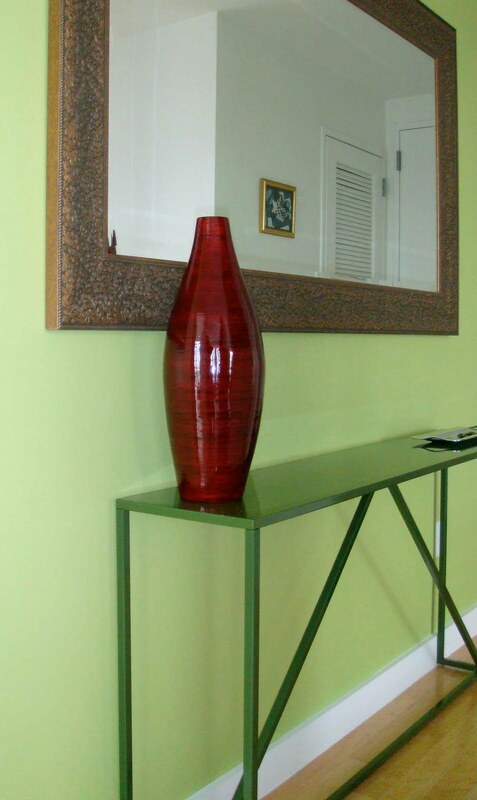 To give the entrance a little zing, we painted one accent wall Benjamin Moore- Stem Green in eggshell, $50.00. I purchased the BluDot Strut Console in olive, for its color, price of $399.00, and slim dimensions. I found this large mirror at Home Goods for $68.00. A total bargain for its size and detail. Then, I picked up the glossy vase at Pier One, on clearance for $10.00. Total: $650.00 with taxes and delivery.